We offer a full array of designer and economical hotel draperies. A simple upgrade to your hotel window fashions can help your guests sleep better and show off the view from their guest suite. Hotel curtains are handled by every guest that comes through the room. 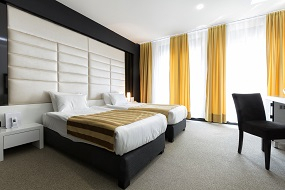 Having a durable and easy-to-launder fabric is a must in the hospitality industry. You can assist in keeping them clean by utilizing a sturdy baton for guests to open and close the curtains. Typical hotel drapes include two layers: a blackout over drapery, and a set of sheers. If you have already chosen your over drape fabric, we can add a blackout lining to this layer. This assists in providing additional sound dampening for your guests. Sheers provide the subtle privacy that your guests require. Allowing natural light in to your guests’ rooms simply makes your customers feel happy. Sheers also provide a uniform look from the outside of the building, keeping all windows cohesive. When it comes to manufacturing hotel draperies, you can find one industry standard: pleats. The over drape and the sheer layer are almost always pleated. Pleats add an additional texture element into the room, and they also serve as a way to securely attach a drapery pin hook from the curtain to the carrier. The second most requested curtain style are ripple fold curtains. We provide everything you need for hotel drapes and hospitality curtains. We manufacture matching cornice boards and hotel valances, and of course, we supply a vast selection of affordable hotel curtain tracks and accessories. Contact one of our knowledgeable sales associates to obtain a quote tailored to your exact requirements.